For instance, there’s a moment when an aging ham actor is pretending to take a bow in the green room backstage. His factotum goes to answer a phone and starts to cross in front of the actor. Years of stage survival skills kick in and the ham automatically reaches out to guide the aide behind him out of the thespian’s imaginary spotlight. Ken Ludwig’s 1995 screwball comedy isn’t quite as strong a script as his hilarious Lend Me A Tenor. In fact, it uses so many of the same conventions that you can almost hear him saying, “If it ain’t broke.…” A stuffy sense of deja vu works against this being a full-out success. 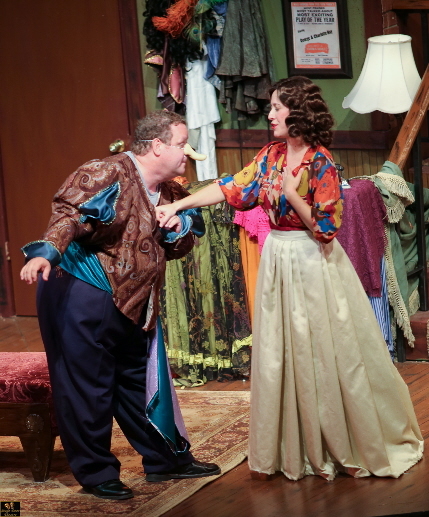 But director Michael Leeds and a cast of clowns led by Ken Clement and Michelle Foytek apply combined decades of acquired skill to one of the more solid comedies that Stage Door has mounted in several seasons. Clement and Foytak play George and Charlotte Hays, has-been second-rate Lunts whose touring repertory company is playing that cultural epicenter of Buffalo in 1953. They are starring in a double bill of Cyrano de Bergerac and Private Lives, neither of which they are suited for anymore. Vain, flamboyant, temperamental, but insanely in love with the molecular structure of Theater, they head a threadbare thespian troupe even more broadly drawn than the Barrymores in The Royal Family. As they prowl the dilapidated green room, they heap disdain on the upstart medium of television and bemoan missing their shot at film stardom. Ludwig, Leeds, Clement and Foytak gently put across that slightly musty whiff of careers dwindling to an end, partly because of a culture that prizes matinee idol looks and because technologies are eroding at their chosen art form. Their fatalistic acceptance evaporates when they luck into a second chance at film roles they just missed out in Frank Capra’s upcoming The Twilight of The Scarlet Pimpernel. Capra is flying to Buffalo to scout their shows. But the likelihood of everyone getting their act together—literally—is problematic because (keep track of this now) George’s infidelity with the ingénue Eileen (Jessica Carmen), the seductive attentions of Charlotte’s would-be lover and the couple’s wealthy lawyer Richard (Glen Lawrence), the return of the Hays’ prodigal daughter and recovering thespian Roz (Susan Slotoroff), her straight arrow beau Howard (Edward Miskie) who considers his career as TV weatherman to have a tangential connection to theater, the emnity of company manager and Roz’s former flame Paul (Andy Quiroga) and the acerbic sniping of Charlotte’s nearly deaf mother and backstage jack of all trades Ethyl (Miki Edelman). Got it? Of course not. If the intentionally mechanical construction of piling one contrivance onto another is bit wearing after a while, Ludwig leavens it with the clockwork injection of more one-liners and cutting rejoinders than a Neil Simon comedy. Some lines are as frayed around the edges as the troupe’s costumes. “This is Buffalo,” Charlotte says. “It’s like Scranton without the charm.” Some version of that line has been appropriated several dozen times over the years. So it’s Foytak’s dry Elaine Stritch delivery that wrings another laugh out of that chestnut. The audience’s familiarity with the verities of farce — from mistaken identity to manic pursuits — is part of the pleasure, as if this was an homage. When Roz sets off to look for her parents, she sits down her nervous beau and assures him not to worry: “Nothing is going to happen in two minutes.” Of course, the peace lasts no longer than it takes one door to close and another to open. The two stars burst in garbed in full Cyrano costumes, furiously fencing down the stairs and all over the furniture, parrying as much with inventive invectives as with their épées. But inexplicably, this production underscores that door slamming farce just isn’t as inherently funny in the 21st Century as it used to be. Even revivals of Michael Frayn’s sublime Noises Off don’t land as solidly as they used to. Maybe the nature of comedy has changed, although I wouldn’t argue that with Aristophanes or Mel Brooks. Fortunately, Stage Door wisely has Leeds to helm this. The veteran comedy director knows how to stage a pratfall but also how to find the humor in the collision of characters. He also adds or allows his cast to create those bits such as George in full Cyrano drag having to tilt his fake proboscis out the way to take a drink of water. The show flows smoothly although portions seemed a little pokey at times during the first Wednesday matinee, but that was likely due to the sparse audience that didn’t feel empowered by a crowd to laugh out loud. It wasn’t the fault of the cast that never stopped pitching as if they had a full house and the Tony nominating committee in the audience. But the standouts are Clement and, in a smaller role, Edelman. Moon Over Buffalo plays through Oct. 6 at the Broward Stage Door Theatre, 8036 West Sample Road, Coral Springs. Performances are 8 p.m. Friday-Saturday; 2 p.m. Wednesday, Saturday and Sunday. Running time 1 hour 50 minutes including intermission. For tickets and information, call 954-344-7765 or visit www.stagedoortheatre.com. This entry was posted in Reviews and tagged Andy Quiroga, Glen Lawrence, Ken Clement, Ken Ludwig, Michael Leeds, Michelle Foytak, Miki Edelman, Moon Over Buffalo. Bookmark the permalink. Absolutely love Ken Clement! Can’t wait to have him back at the Plaza Theatre!